Cottonwood Trail is worthy of having a trailhead along framed Pierce Stocking Drive, featuring several scenic viewing points of its own. 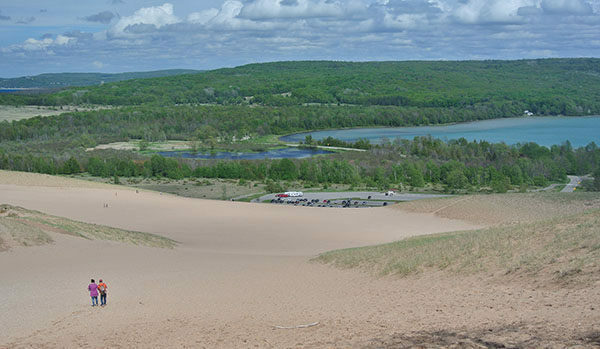 The 1.7-mile loop winds through the perched dunes above the Dune Climb and provides a close look at the beauty of these shifting hills of open sand as well as the vegetation such as bearberry, buffaloberry, beachgrass and cottonwoods that are slowly stabilizing them. Cottonwood is an interpretive trail with nine posts that correspond to a self-guided brochure available at the trailhead or can be downloaded from MichiganTrailMaps.com. Pierce Stocking Scenic Drive is a 7.4-mile, one-way loop within Sleeping Bear Dunes National Lakeshore that is often called “the slowest, shortest, but most scenic stretch of pavement in the state.” The speed limit is only 15 miles per hour on this single lane road but it passes four stunning overlooks that include the national lakeshore’s famous perched dunes, Lake Michigan shoreline and Glen Lake. So spectacular is the scenery that most people don’t want to leave the road and pass up the Cottonwood Trail that departs Pierce Stocking Scenic Drive at stop No. 4. Cottonwood Trail is worthy of having a trailhead along the drive, featuring several scenic viewing points of its own. The 1.7-mile loop winds through the perched dunes above the Dune Climb and provides a close look at the beauty of these shifting hills of open sand as well as the vegetation such as bearberry, buffaloberry, beachgrass and cottonwoods that are slowly stabilizing them. Cottonwood is an interpretive trail with nine posts that correspond to a self-guided brochure available at the trailhead or can be downloaded from MichiganTrailMaps.com. The brochure describes the plant life and geology of the area and explains why the mounds of advancing sand in this ever-changing land are so special and so fragile. 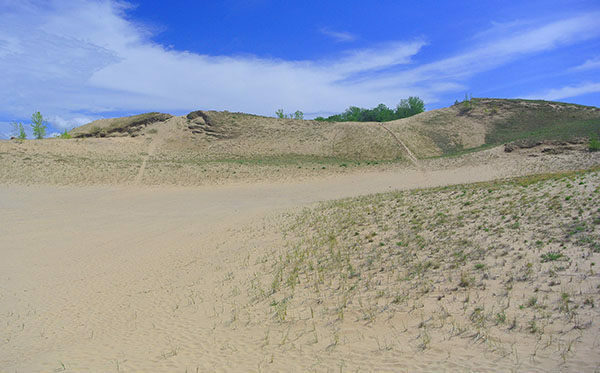 The rolling dunes that surround the trail are part of Sleeping Bear Plateau, a 4 square-mile highland that raises more than 400 feet above Lake Michigan and is covered with a veneer of perched dunes. The price for this unusual scenery is that much of trail, particularly the first half, is through loose sand and hilly. Both can be tiring, the reason this loop of less than 2 miles is rated moderate in difficulty. From the information kiosk Cottonwood Trail descends as a boardwalk at first, quickly passing three posts, one of them warning about poison ivy. In less than a quarter mile you reach the junction of the return trail and head right. At this point the trail is skirting a huge blowout where the prevailing southwest winds have carved out a smooth bowl-like depression. Its concave windward side is now too tempting for some hikers not to scramble up it. Beyond post No. 5 you begin a steady climb and at Mile 0.5 top off on a small sand-and-grassy knoll at 888 feet in elevation. The view is magnificent and includes Lake Michigan off in the distance along with Pyramid Point and the Manitou Islands. Almost 300 feet below you is Glen Lake. For the next quarter mile you follow a sandy ridge of the dune and enjoying the wonderful views from it before climbing to a patch of cottonwoods at Mile 0.75, featuring post No. 7 and two benches. As good as the views have been so far, this one is the best. All around you is a stunning panorama that includes open dunes, Lake Michigan, inland lakes, historic farms and faded red barns. Almost directly below is the park’s famous Dune Climb and if it’s the middle of summer the climbers will look an army of aunts scurrying up the steep slope of sand. 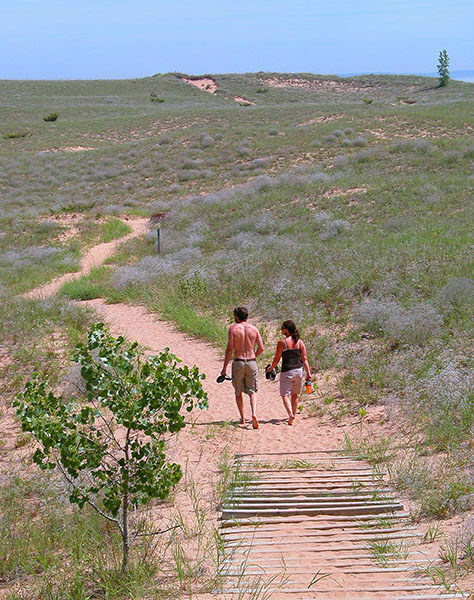 It would be easy at this point to descend to the Dune Climb picnic area or to the start of the Dunes Trail. Cottonwood Trail heads west, descending off this high point to post No. 8 and then swings south for a return to Pierce Stocking Scenic Drive. Post No. 9, noting a rare stand of paper birch not normally seen in dune country, is reached at Mile 1.1 and the junction is less than a half mile from there. The Cottonwood Trail has its own parking area next to the often busy Dune Overlook parking area but there is no drinking water at the trailhead. Nearby is Picnic Mountain with drinking water, toilets and picnic tables. The drive is open from 9 a.m. until sunset May through mid-November and requires a park entry permit that can be purchased at the Pierce Stocking contact station or from the visitor center. From the Philip A. Hart Visitor Center and NPS headquarters in Empire head north on M-22, veer left on M-109 and in 3 miles is the posted entrance to Pierce Stocking Scenic Drive. Follow the one-way road to post No. 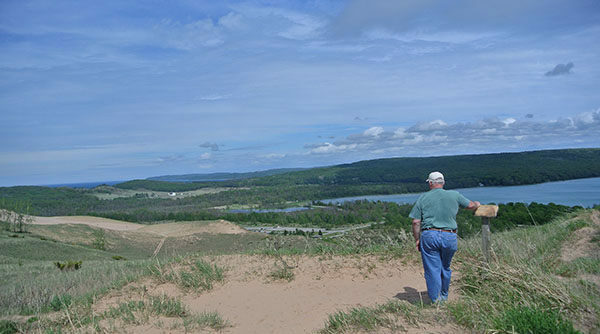 4, marking the Dune Overlook and reached 2.3 miles from M-109.